Castle in the Air: A Castle in the Air Craft on Martha Stewart! A Castle in the Air Craft on Martha Stewart! I am so delighted to share a tutorial that we recently put together for the Martha Stewart Craft Department. Crepe paper tassels and rope have been our favorite paper decoration here at the Castle since Anandamayi Arnold and Aimée Baldwin first taught it here so many years ago. 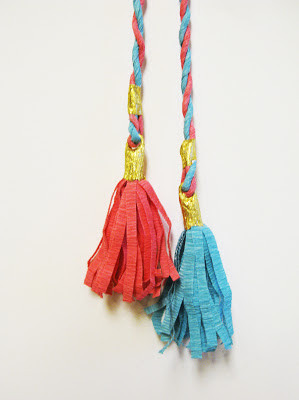 It doesn't matter if we are playing castle or fiesta, tying back a curtain or dressing a hat, there is nothing like a tassel to add that splash of fancy and color. Enjoy!